Increase Retail Business—Plant Trees! | Good News Tree Service, Inc. Numerous scientific studies have been conducted that prove that planting trees and then properly caring for them increases retail business not a little, but substantially. In fact, the investment cost of planting and caring for trees pays business owners back much more than what it cost. Here is some data to validate this point. Shoppers in retail districts with a healthy and plentiful tree canopy will spend nine to twelve percent more for products, travel further and spend more time there (https://www.fs.fed.us/pnw/pubs/journals/pnw_2005_wolf001.pdf; https://depts.washington.edu/hhwb/Thm_Economics.html; Wolf, K.L. 2005. Business District Streetscapes, Trees and Consumer Response. Journal of Forestry 103, 8:396-400; Wolf, K.L. 2005. Business District Streetscapes, Trees and Consumer Response. Journal of Forestry 103, 8:396-400). Owners of commercial office buildings can charge seven percent higher rental rates for commercial office spaces that have high quality landscapes (“The Influence of Trees and Landscaping on Rental Rates at Office Buildings,” by Laverne, R.J., and K. Winson-Geideman., 2003; Journal of Arboriculture, May 2003, “Social Aspects of Urban Forestry,” by Kathleen L. Wolf at https://www.fs.fed.us/pnw/pubs/journals/pnw_2003_wolf002.pdf). One of the most little-known facts about trees’ effects is the importance of their impact on central business districts. Downtown districts are the places where small businesses meet the everyday needs of nearby residents, and are the soul of a community. They significantly contribute to the local economy and provide jobs. Trees help make these places more welcoming and appealing. The ways in which trees and other urban greenery affect shoppers is subtle, but the outcomes are all about the bottom line. Below is a summary of what we’ve learned. Our studies assessed how trees influence shoppers’ perceptions in various retail settings, from the central business districts within several large cities to smaller main street malls. The findings were remarkably consistent. 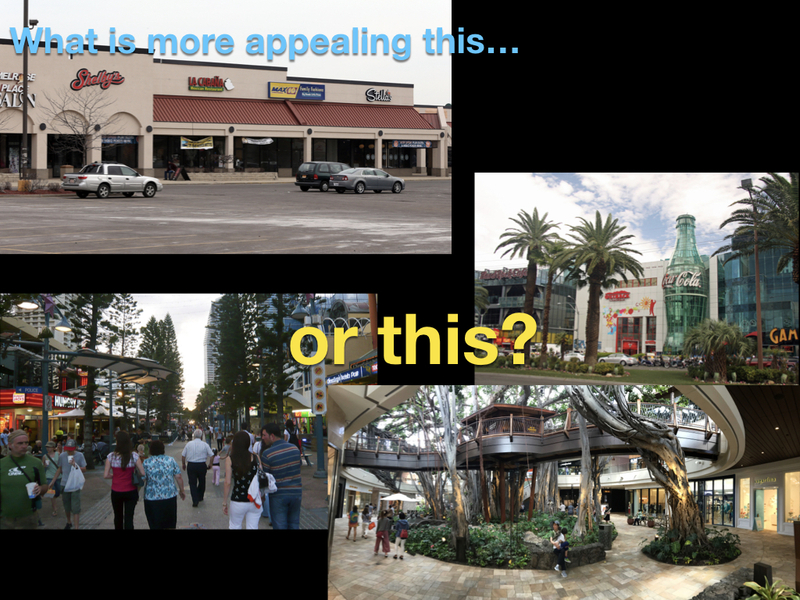 When comparing similar places, some having trees and some not, trees elicited positive reactions from customers. We used surveys to test responses and were careful to present images of settings having the same level of building care and street tidiness. First, judgments of product value, product quality, and merchant responsiveness were more positive in places having trees. People infer that they will have better experiences in more attractive settings. Second, people claimed they were willing to travel more often, for more time, and over greater distance to a retail district having trees. This means that a district having a quality urban forest may attract visitors over greater distances, boosting the number of possible customers. Third, visitors said they would spend more time in those districts with trees once they arrived. Customers were also willing to pay more for products and services, by up to nine percent in the smaller communities and up to twelve percent more in districts within larger cities. People even claimed that they’d pay more for parking. Planning, planting, and the maintenance of trees are real costs. But, this finding suggests that those expenses may be offset by the additional revenues they help bring in. Consumer purchasing represents about two-thirds of the economic activity of the United States. Independent merchants in inner-city neighborhood business districts, once key retail players, now face competitive pressure from regional malls, “big box” retailers, and e-tailers. How does the local merchant preserve or restore his or her slice of the economic pie? Study results suggest that higher price valuations are mediated by psychological inferences of district character and product quality. Thus, creating and stewarding an urban forest canopy may enhance revenues for businesses in retail districts that offer diverse products at varied prices. Consumer purchases provide compensatory returns for districtwide costs of tree planting and maintenance, as well as revenue enhancement for individual businesses.